About a year ago I was fortunate enough to grab this beautiful piece from Cindy over on DT. It's been kicking around my apartment in various shapes and forms for a while as I've slowly started restoring it to working condition and beyond. Now that I'm undertaking some of the final steps I thought it would be nice to put together a proper build log. 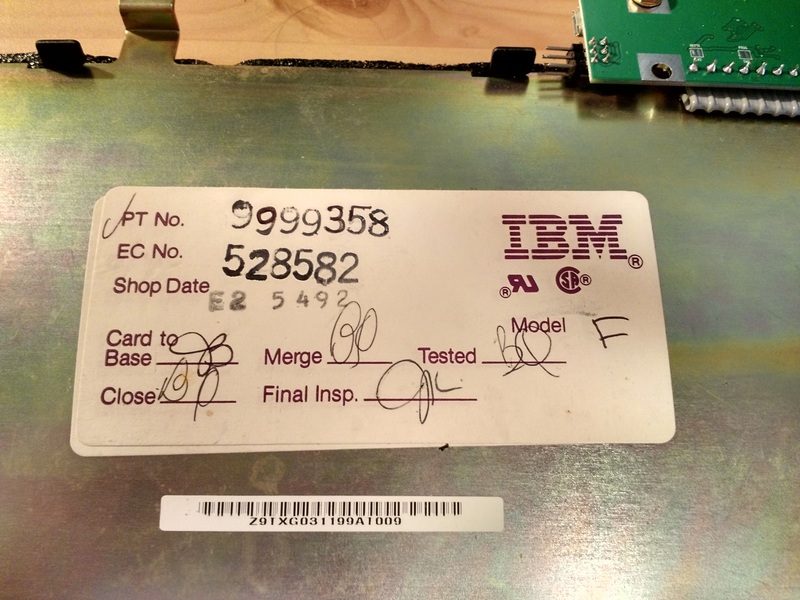 I know there are a couple Model F 107-key logs floating around, but I thought more info couldn't hurt, and if I learned anything from my Model M bolt-mod, it's that there is a ton of little variations in each IBM model. 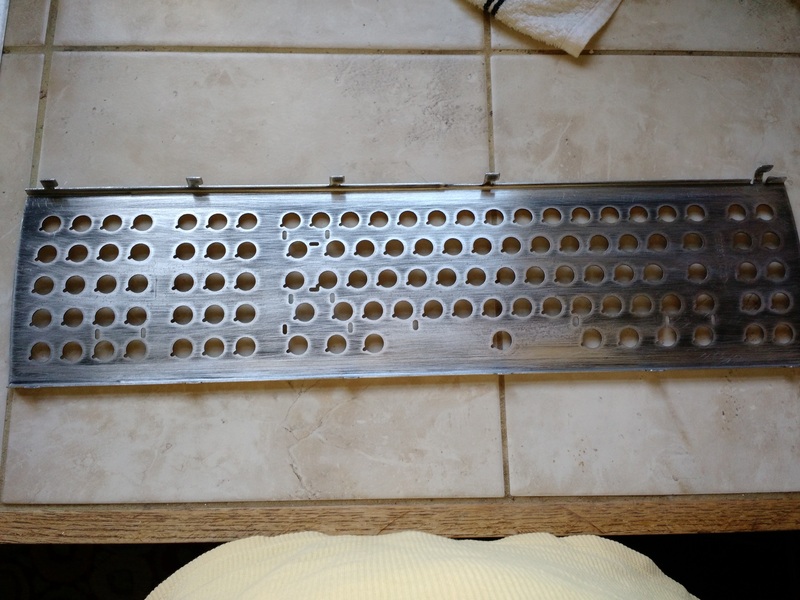 She cleaned up quite nicely, though when cleaning the inner assembly I noticed some corrosion and a couple nontrivial rust spots on the barrel plate and back plate. I knew then that I wanted to go through the sanding, painting, and inevitable foam-replacement process, though I was not excited to do so. And so the board sat, for about 8 months, unused as I went about other projects. Until one fateful day when I was traded a beautiful Blaze Blue Buckling Spring Wrapped KWK, and was immediately inspired to make it my mission to focus this board around it. 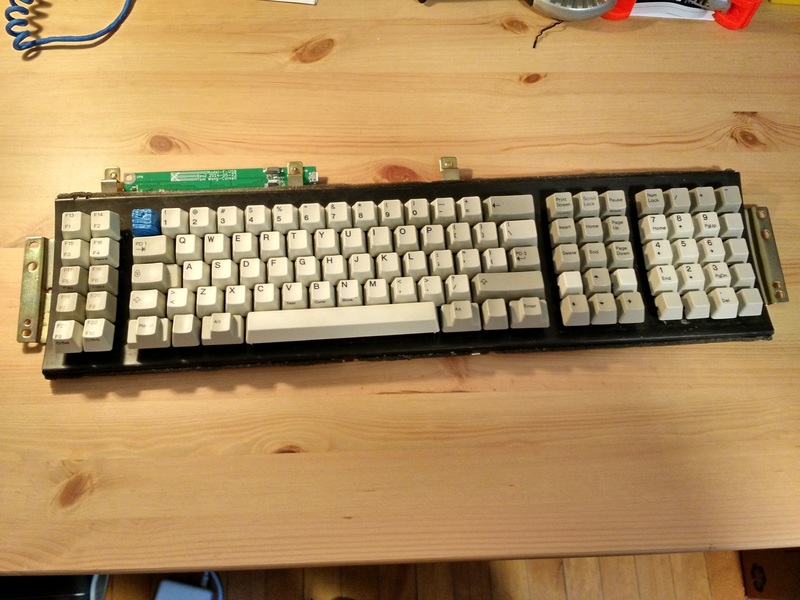 So, KWK in hand, I ordered a Model F xwhatsit, the necessary essentials to wrap my own paracord USB cable, and some spare Model M caps from XMIT and set out to restore the board to working order. And so it stayed again, for another couple months. The board worked fantastically, but there was a nagging inside. 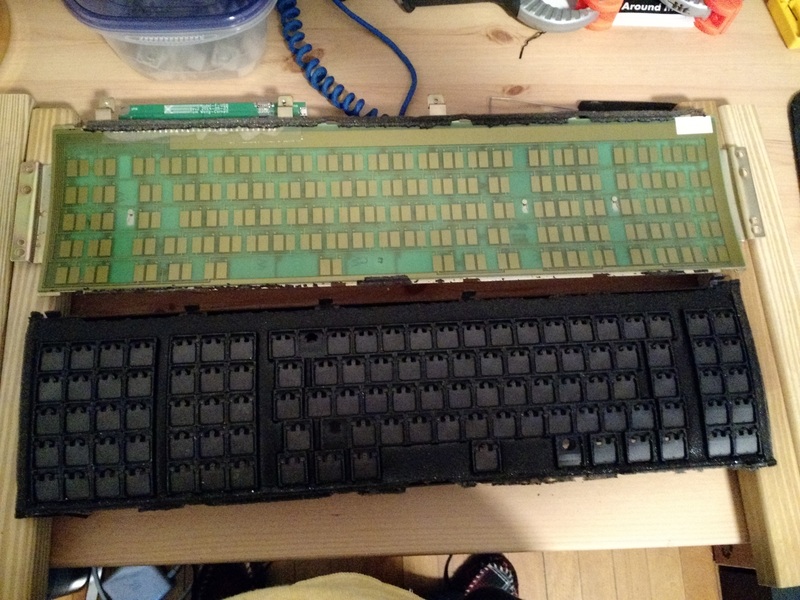 I knew deep down in my core, that rust was still there, that foam was degraded, and that board wouldn't be complete until it had been reconditioned internally (and converted to ANSI!). 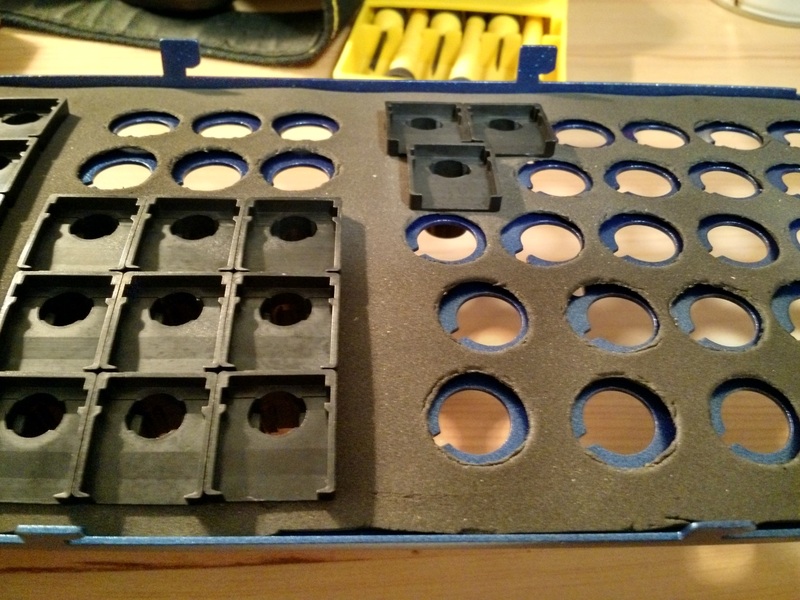 And so, we approach this past week, where after collecting all of the various tools and supplies I would need (sandpaper, metallic blue Rust-Oleum to match the cable and KWK, clamps, leather punches, and foam...) I finally cracked her open for her invasive makeover, and to document the process. Here you can see some of the serious rust that's been eating away at her. Let's make sure she doesn't ever have to worry about that again! 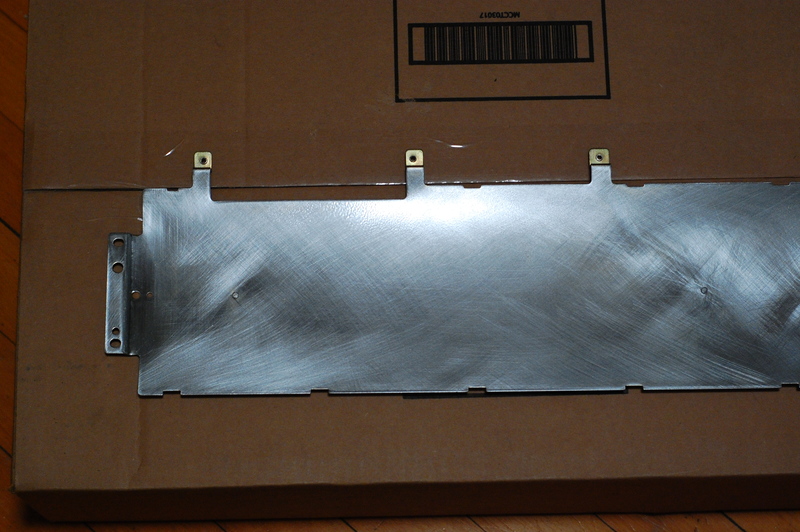 It was folded completely flush to the back plate prior to me peeling it up with a screwdriver ever so slightly. Pretty seriously strong tab to fold over, these boards don't go anywhere that they don't want to. Some closer shots of the foam. It looks nice at first glance, but the stuff has practically melted to the barrel plate over the years. In short: it's gross. 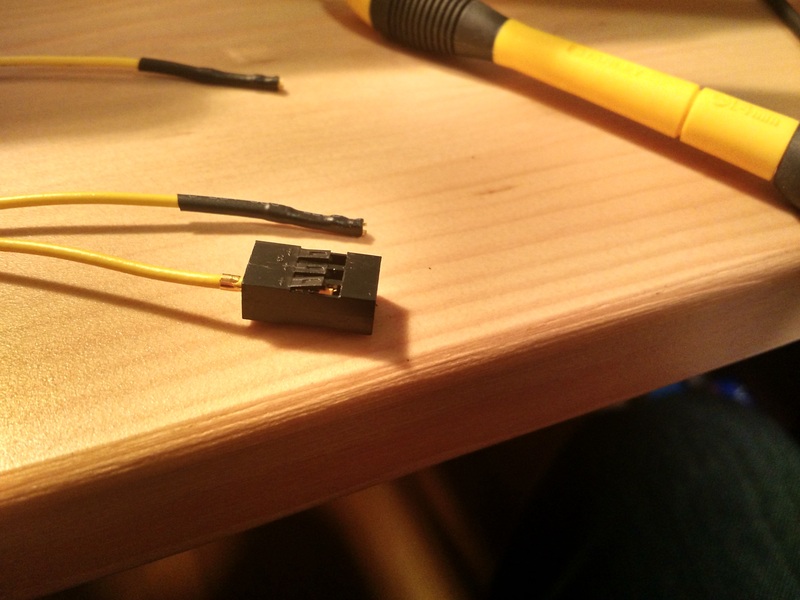 And a close-up og the backside of the plastic wire stabilizer mounts. It's a little tough to tell, but it looks like they were sort of riveted in, with the back side of the mount melted slightly to lock the mount into the hole in the barrel plate. 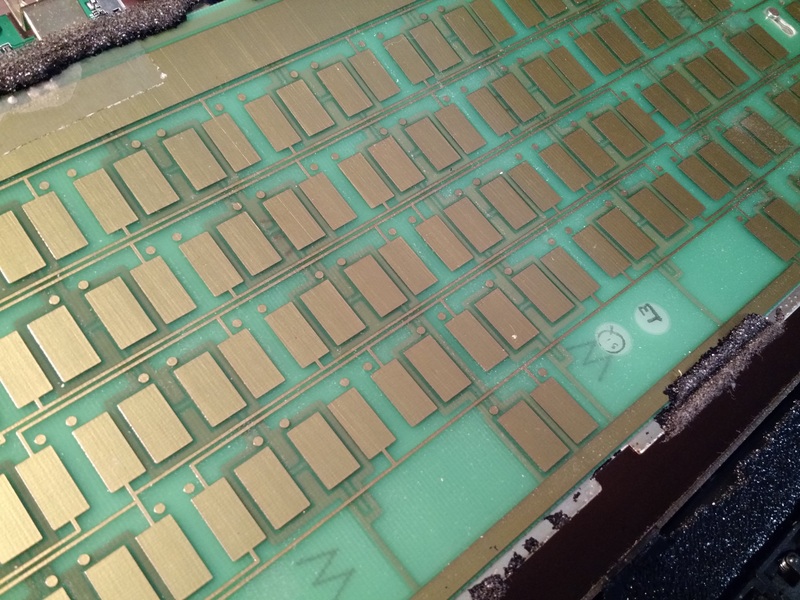 Finally, some shots of the PCB. That gross foam is EVERYWHERE! 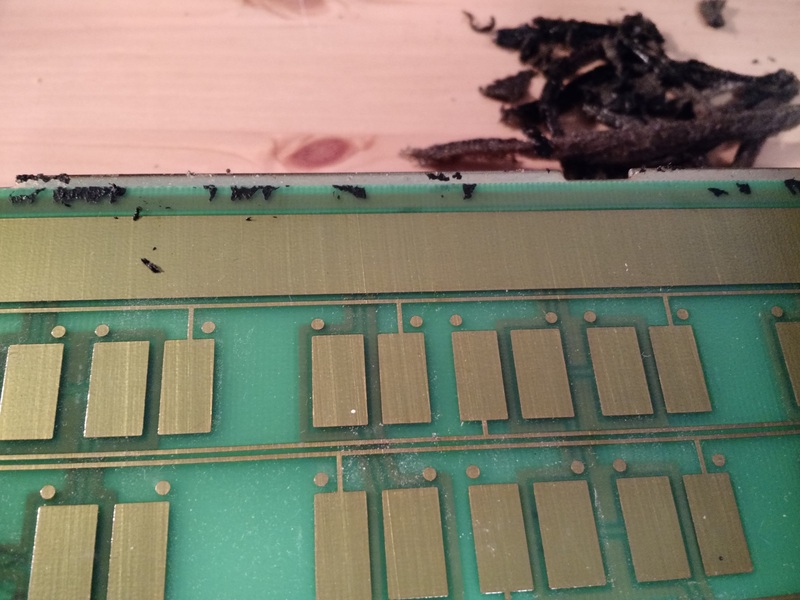 Stuck to the edges of the PCB, going to need to clean all of that off eventually. 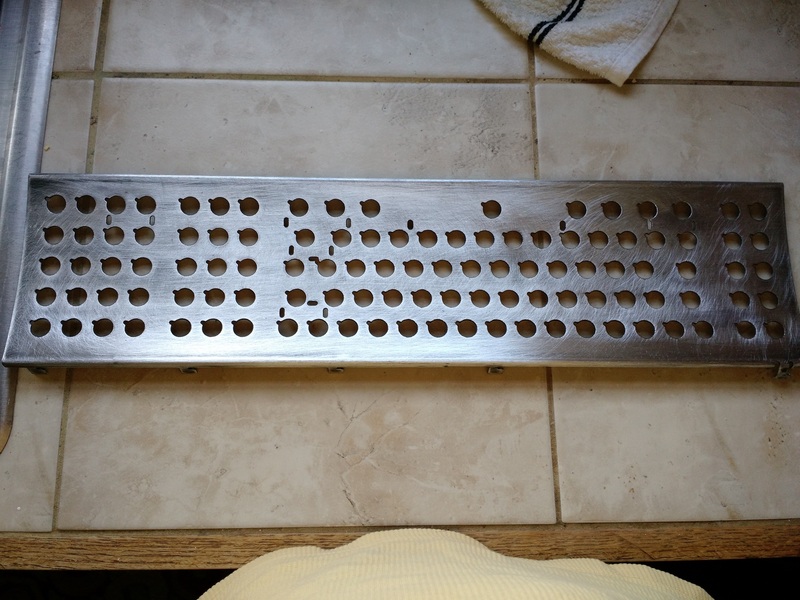 My next goal is to sand the barrel plate and paint it with the Rust-Oleum, as well as cleaning the individual barrels (I'm thinking some denture tabs should do the trick nicely). 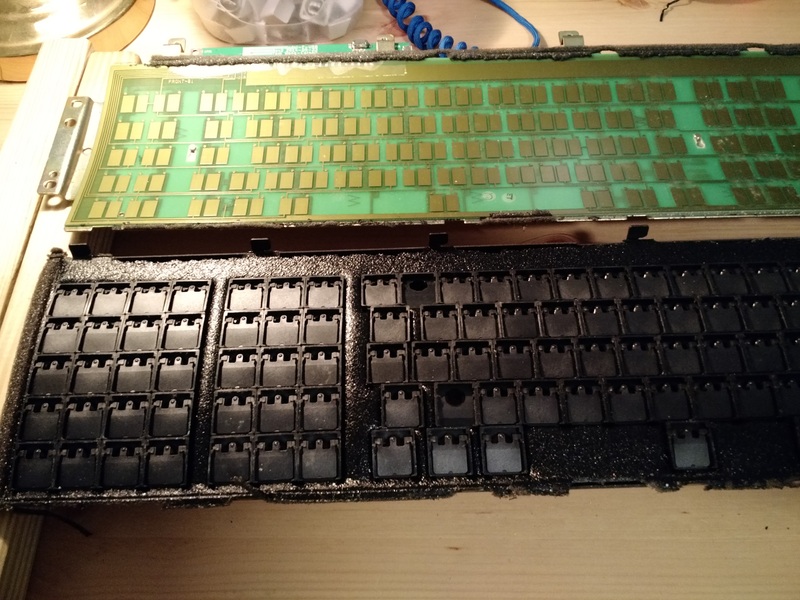 Following that, prepping the foam, and then doing a similar sand+paint to the back plate and a thorough cleaning of the PCB. For another day! I'll be updating this thread as I go. thanks for this detailed log. looking forward to the updates! This is really interesting. 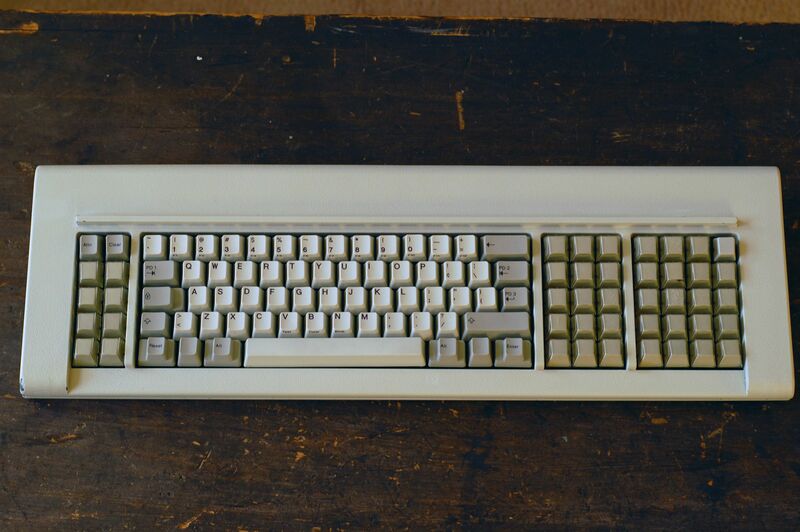 I've not gone back through GH's archives to find any build logs or walkthroughs on restoring a Model F, and in fact, my unfamiliarity with the process is a major reason I haven't shelled out for an F yet. 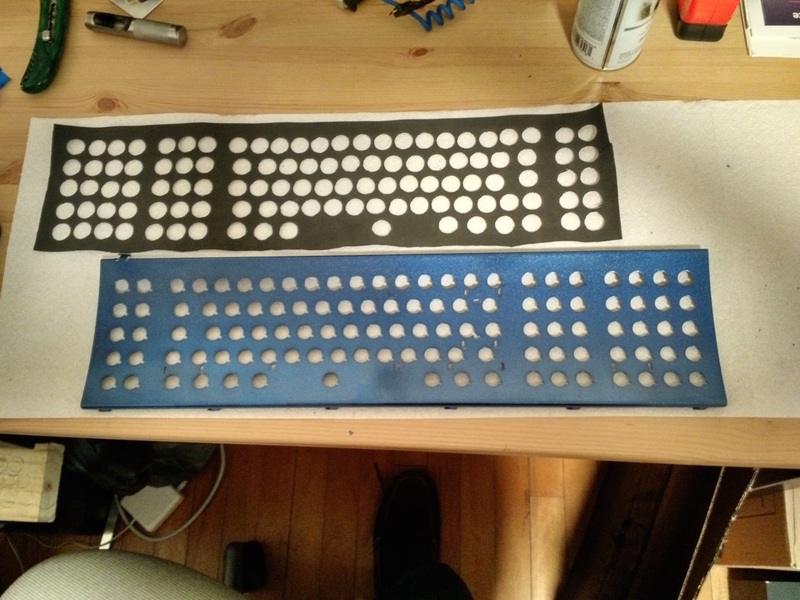 But it looks like a pretty fun project so maybe I'll have to move that up on my keyboard calendar. Once I see that you've managed to do it successfully, that is. Nice and detailed, keep up the good work! 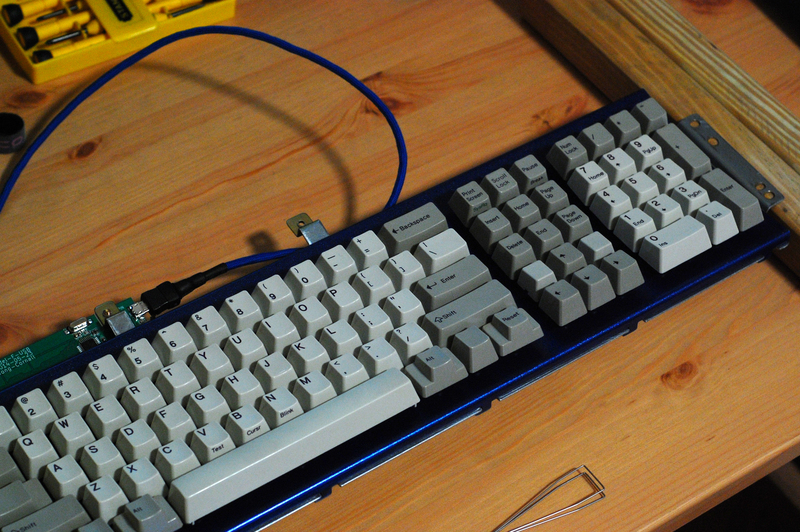 Nowadays I don't bother trying to re-install the tabs because I go to more modern keys and caps, but the wire for the space bar cannot be avoided. 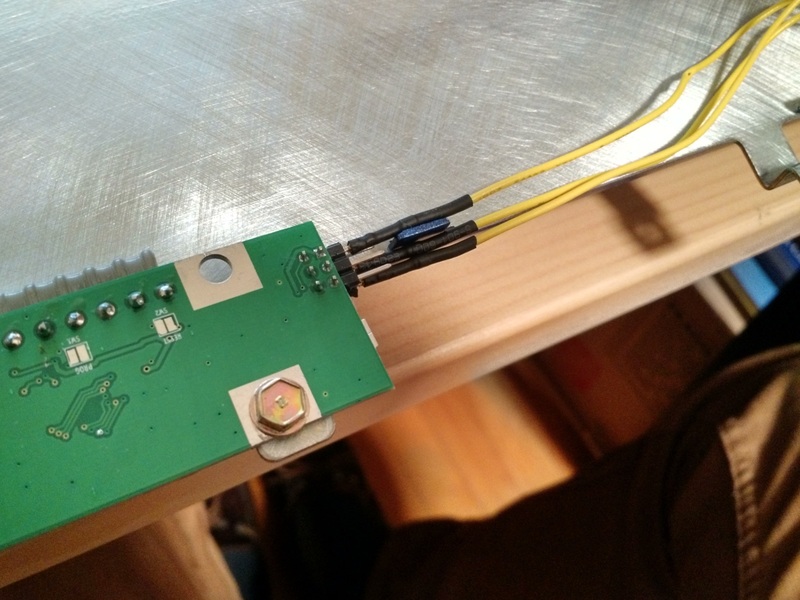 In my guide, I have a picture of some rather crude "Z" tabs that I made and epoxied down to accommodate the "M" thickness wire, which I still consider to be the best solution. 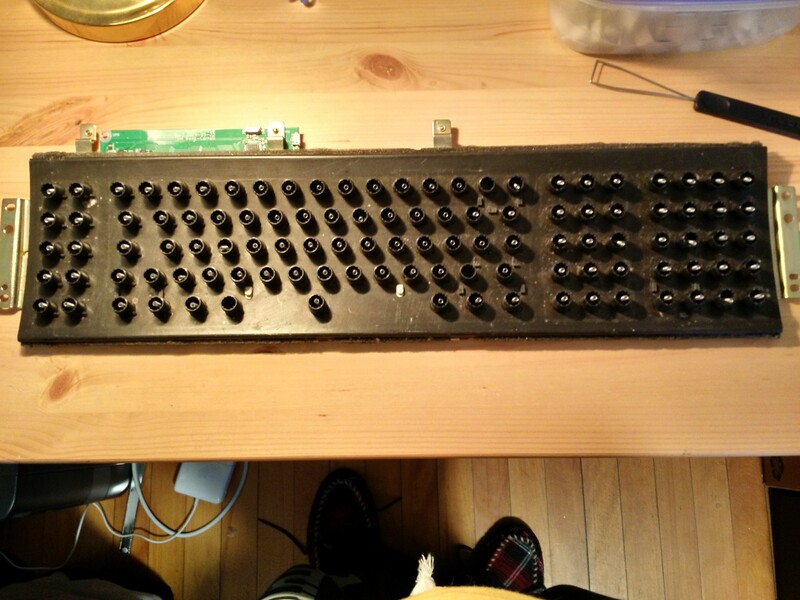 "M" parts are easy to obtain, and original parts can be bought from clickykeyboards if you are a Unicomp-hater. 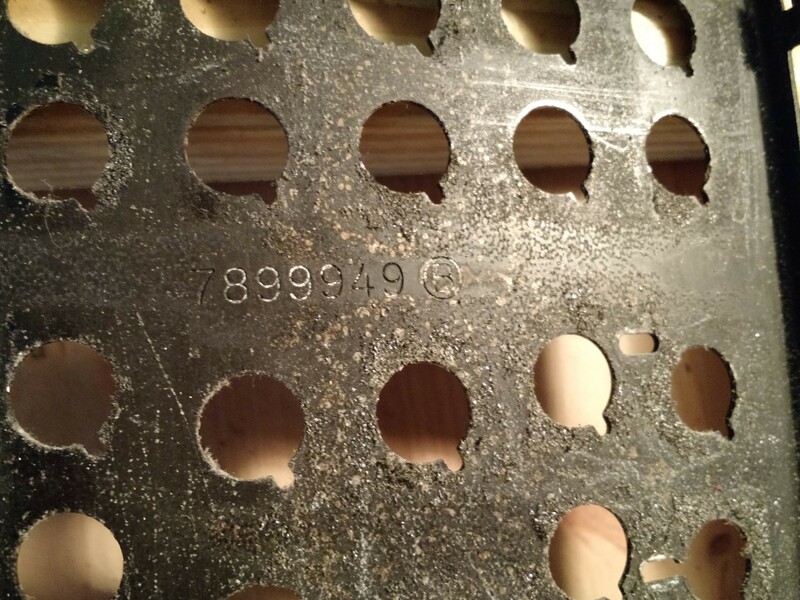 The easier and non-destructive solution, dreamed up by wcass, is to use 7/16" SAE washers (it has to be that specific type) dropped over the barrels and allowing gravity to keep the wire down. This makes for a rather rattly space bar, but works well unless you hit the extreme ends of the bar (we all tap it near the middle, regardless of which hand, don't we?). And it takes no time and is completely reversible. 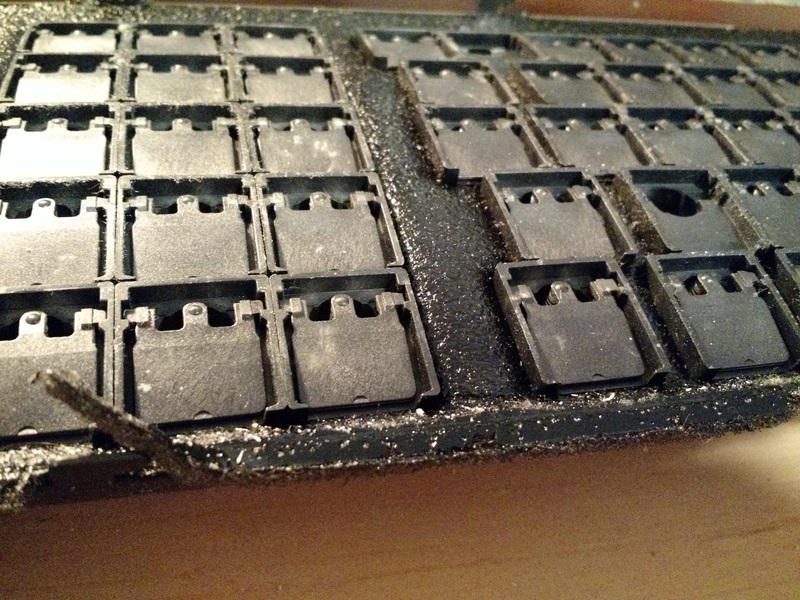 Last, when I reinstall tabs (on an Alps plate, for example) I do it as soon as the paint has dried to the touch. 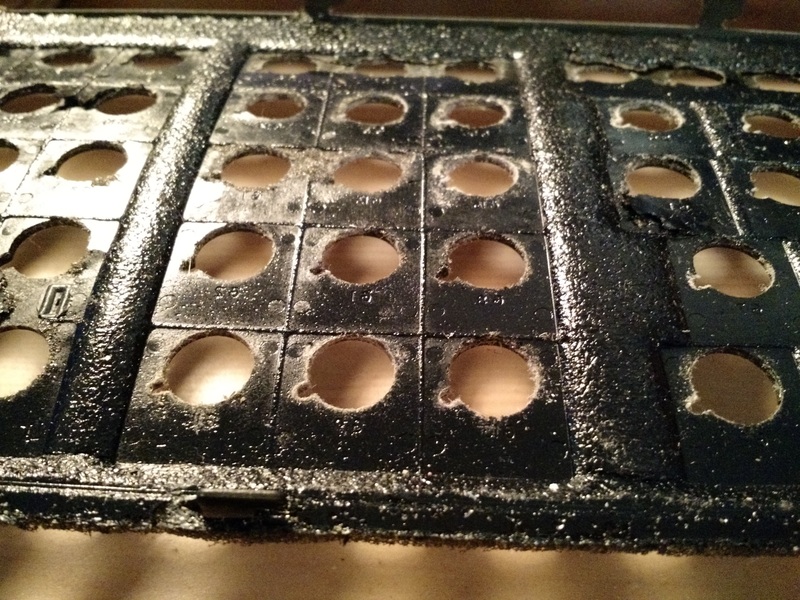 I figure that the paint is still somewhat soft and if it "cures" around the plastic it will help glue them in. 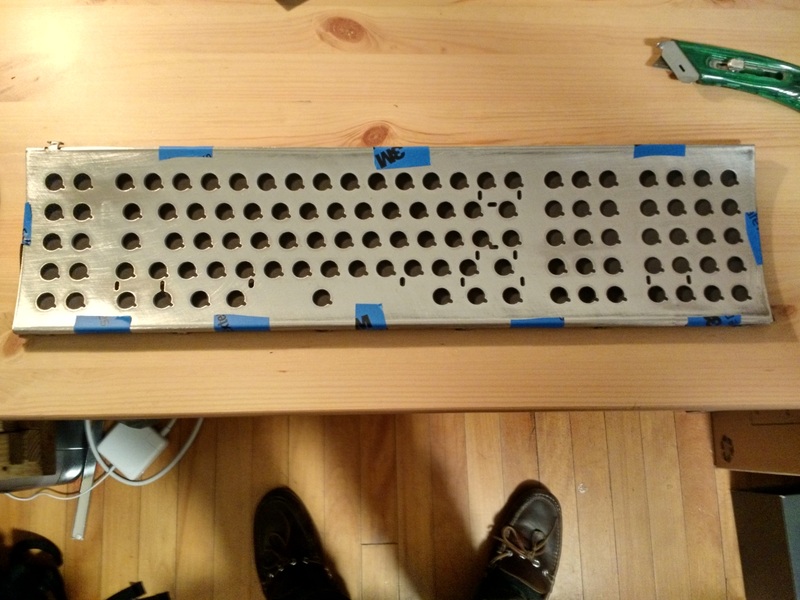 The one thing that I'm going to try which I don't see documented anywhere is sanding and painting the backplate, which the PCB sits on. 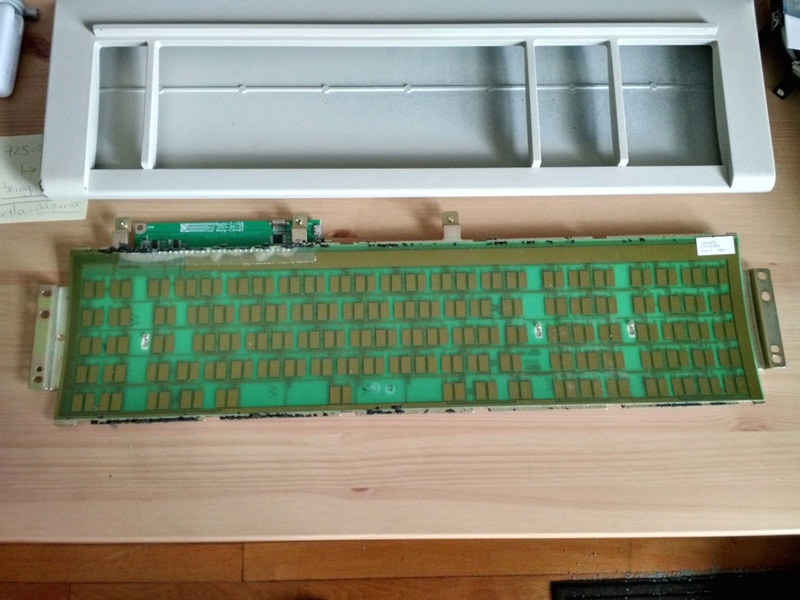 I'll put up some pictures of how that assembly fits together once I get around to cleaning that half of the board up, it's pretty neat how they slide together. 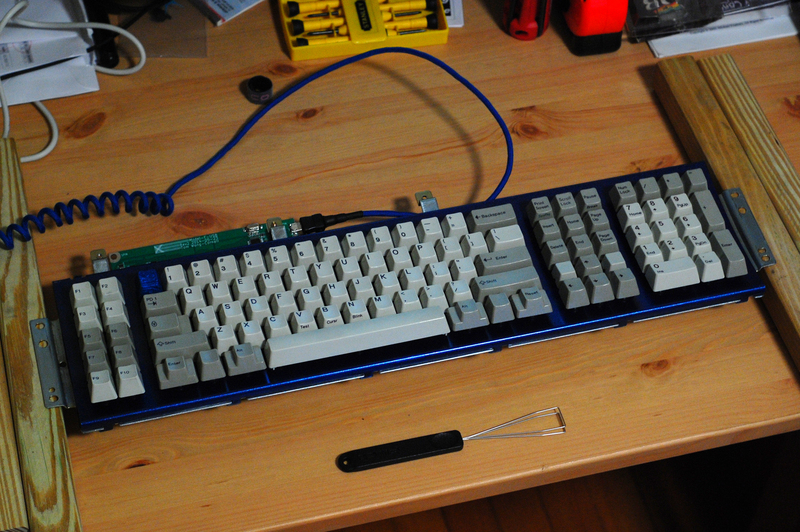 Actually, the entire board is pretty interestingly assembled via sliding everything together. 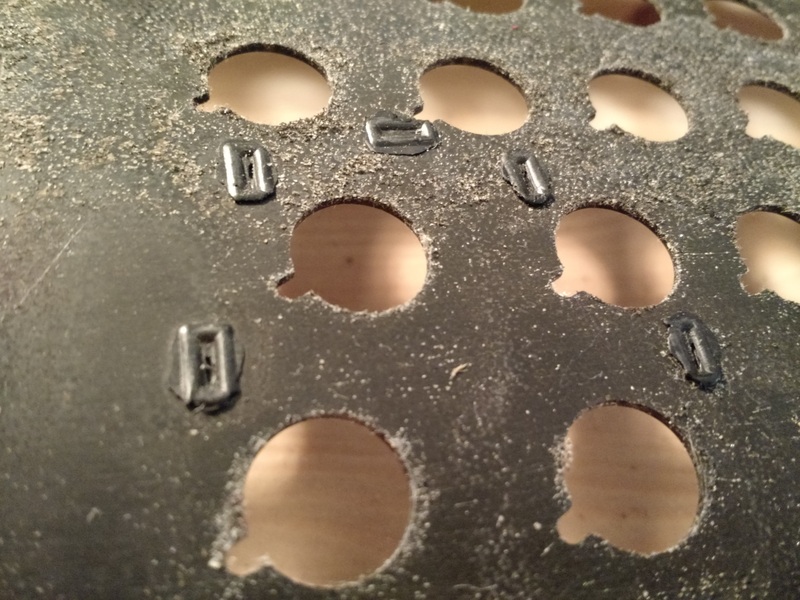 The only screws on the entire board are the 4 that go through the holes you can see on either side of the assembly to fix it to the case, and the one that holds and grounds the controller. 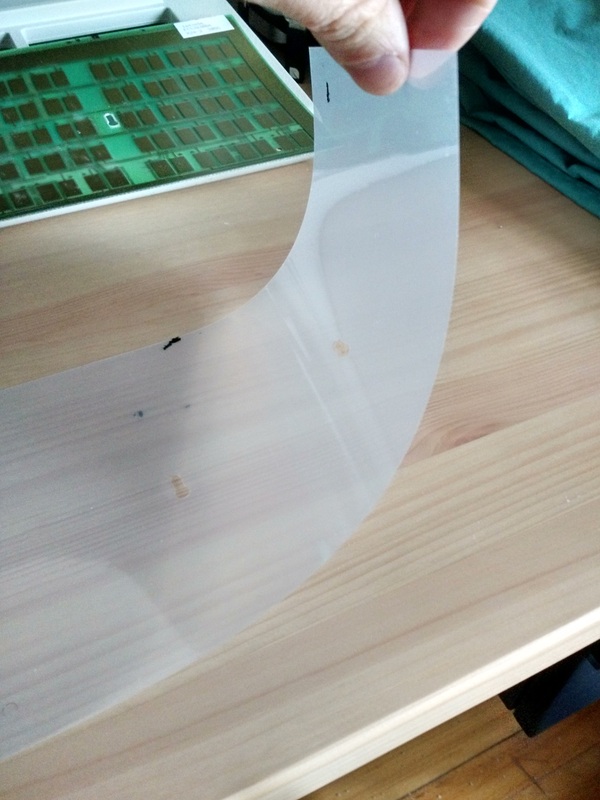 There's basically a plastic sheet that sits between the PCB and backplate, so I'm thinking there shouldn't be any problem with the PCB contacting something it doesn't like. But if anyone has reasons why that's not a great idea let me know. 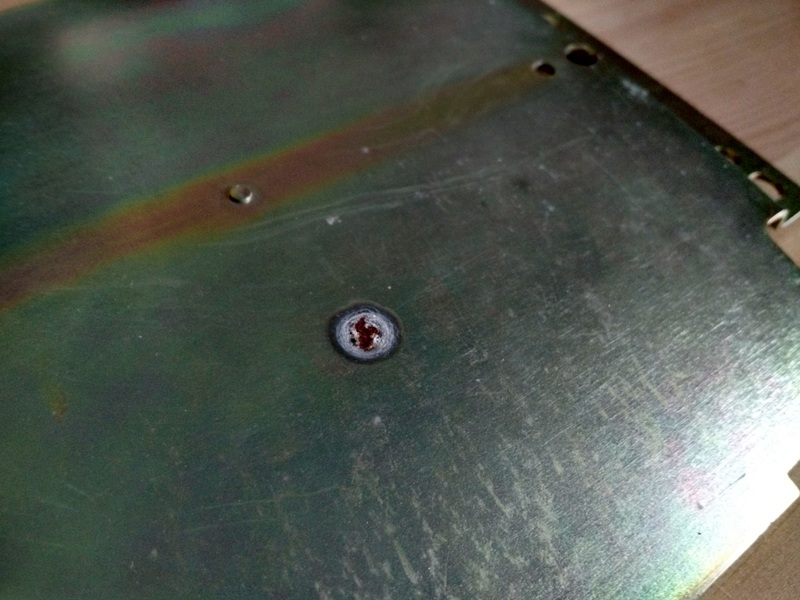 The rust spots on the back of the backplate definitely need doctoring though. 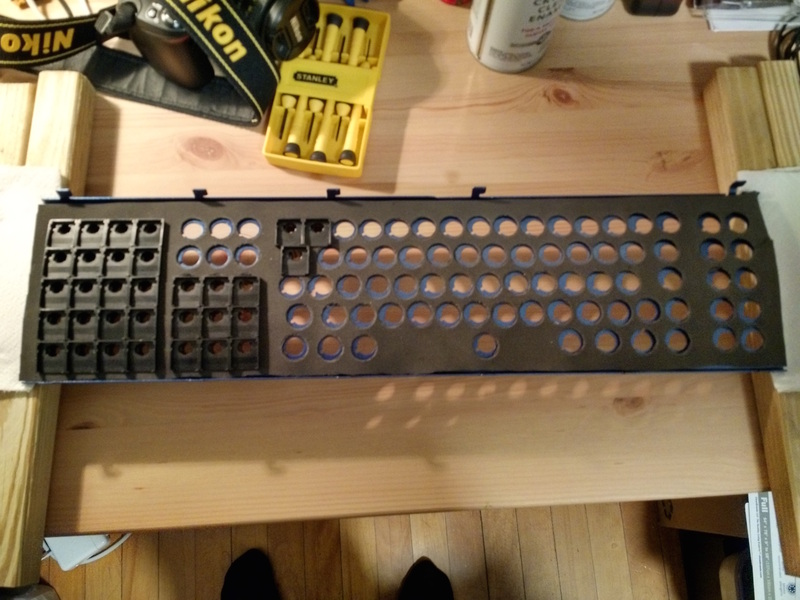 I'm planning to do the backplate in a clear glossy Rust-Oleum that I used for my Model M's backplate. I continue to be completely flummoxed at how people find these threads. Of all my guides, there were 2 that I killed, deprecated, and told people not to use, (at least a couple of years ago) yet people still somehow manage to find them. The proper current guides are compiled by jdcarpe as a sticky at the top of the "making stuff" section. It's taken me a while to compile all of the pictures from my recent progress, longer than I would have liked, but I'm back with the finishing progress! After cracking her open I started sanding the barrel plate while the barrels soaked in denture tabs. They had some nasty foam stuck on them and the denture tabs did an alright job breaking it up, but plenty of it had to be manually cleaned off. 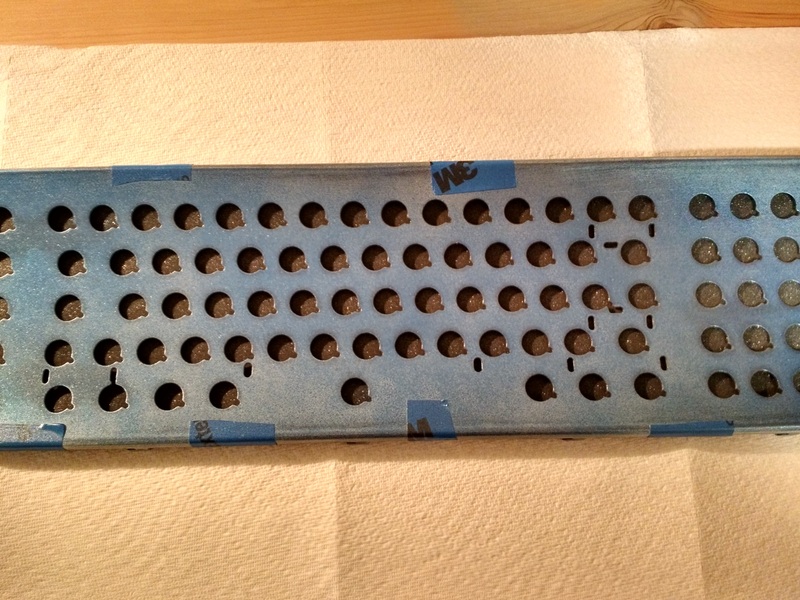 I used some 120-grit sandpaper to remove the paint and any rust on both the barrel plate and the back plate. 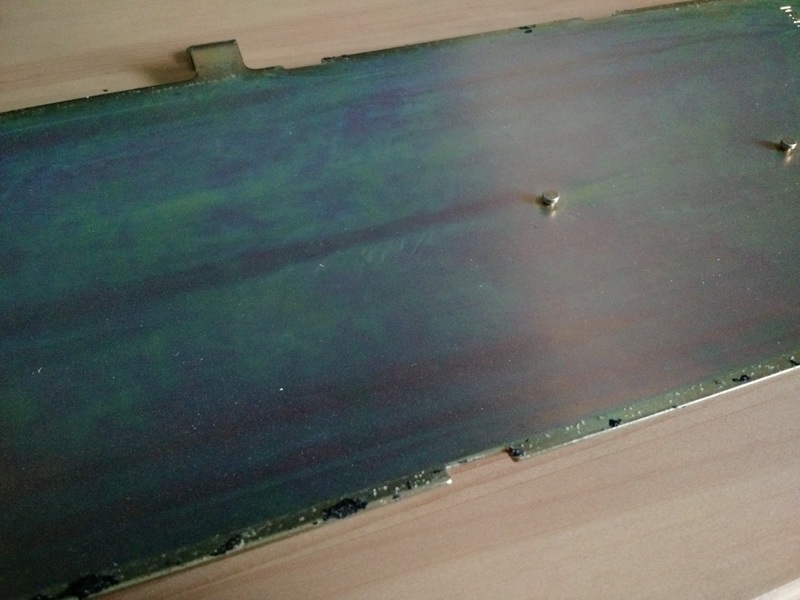 There’s still a bit of discoloration from the spotted corrosion(? 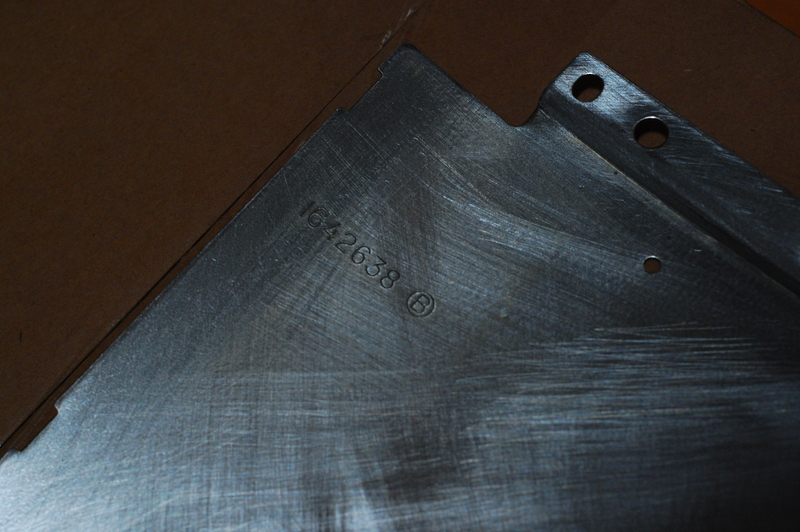 ), but I’m not thinking it would come off without some more serious removal, and 120-grit is enough for my tastes. Next up was the foam replacement. I cut a piece of the McMaster Carr neoprene foam that’s been recommended elsewhere to fit the underside of the barrel plate and taped it on with painter’s tape. 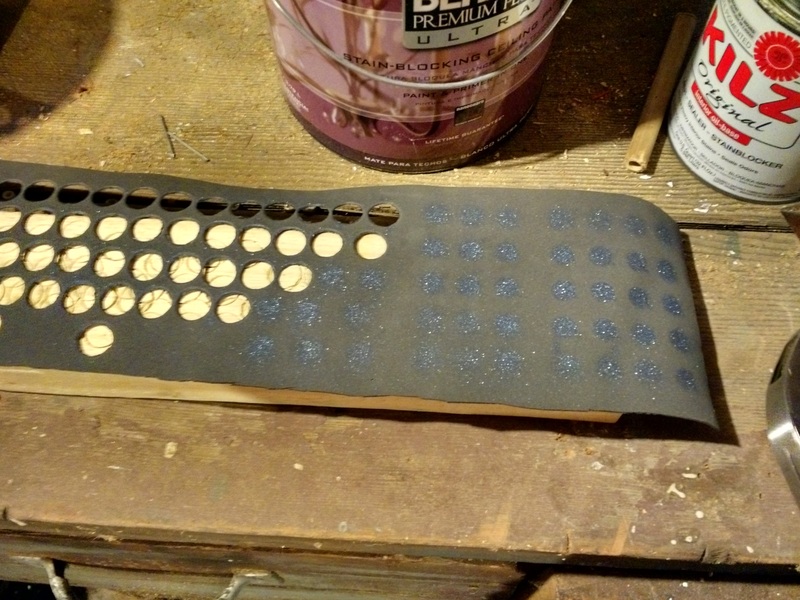 I’m attempting to replicate the idea of using the paint for the barrel plate to create indicating marks on the foam for the barrel holes. But there was still enough to make out where the barrel holes needed to go. 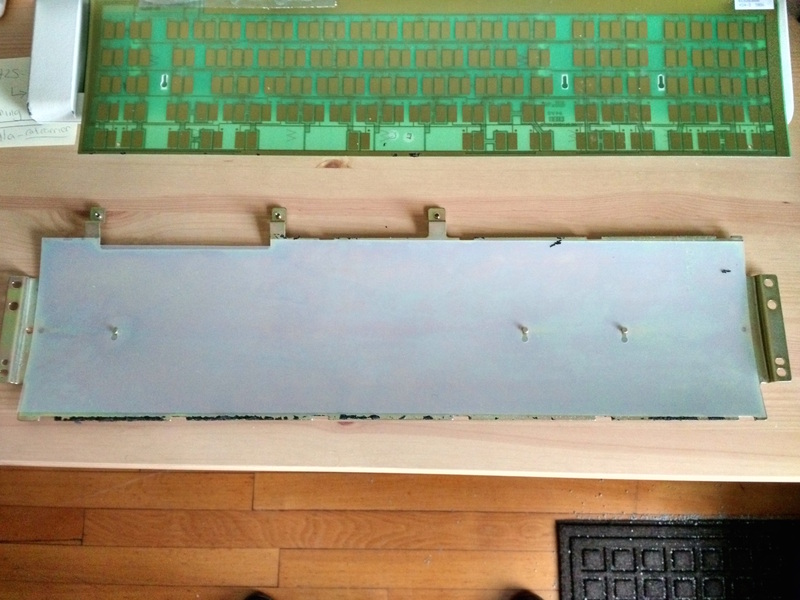 You can see from the above pictures, the first coat went on extremely light; it barely colored the bare metal. However, the second and third coats went on very nicely and created a solid set of layers. 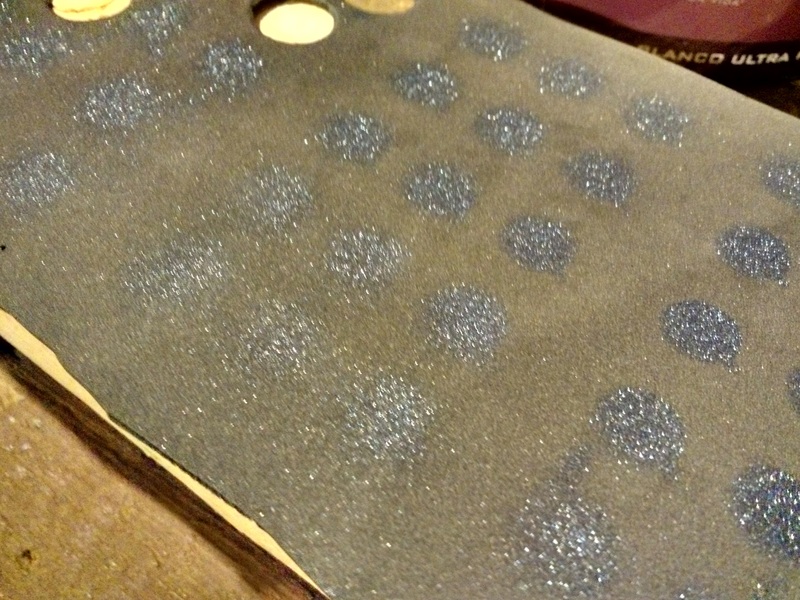 I used 600-grit waterproof sandpaper to wet sand in between the three coats. 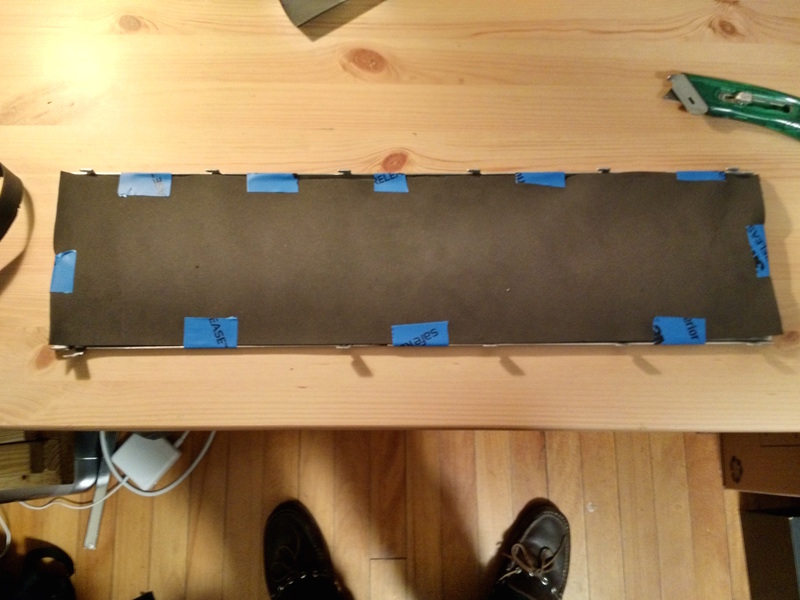 I also left the last coat raw to avoid sanding off on the corners inadvertently, as well as give some tackiness so that the stabilizers fit back in snugly. Overall, I’m very happy with how the Rust-Oleum came out. 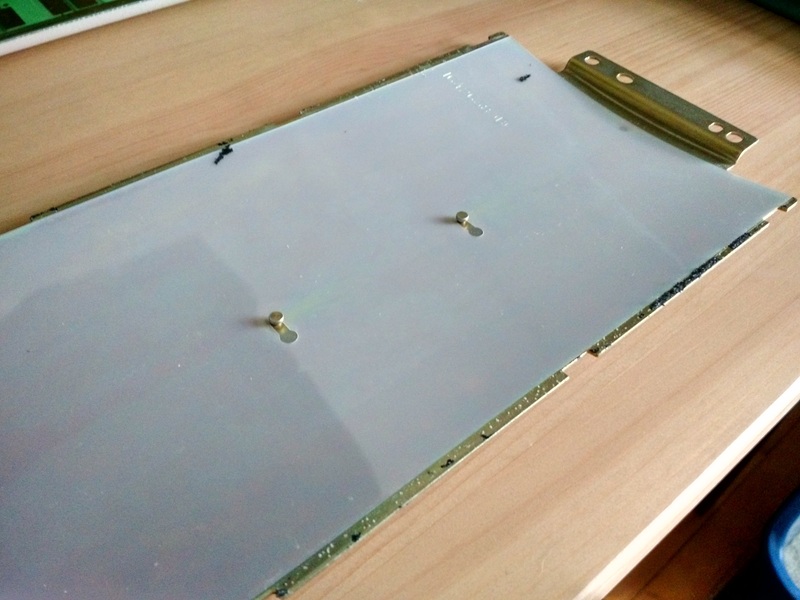 Next up, was separating the PCB from the back plate so the plate could be sanded and the PCB cleaned. 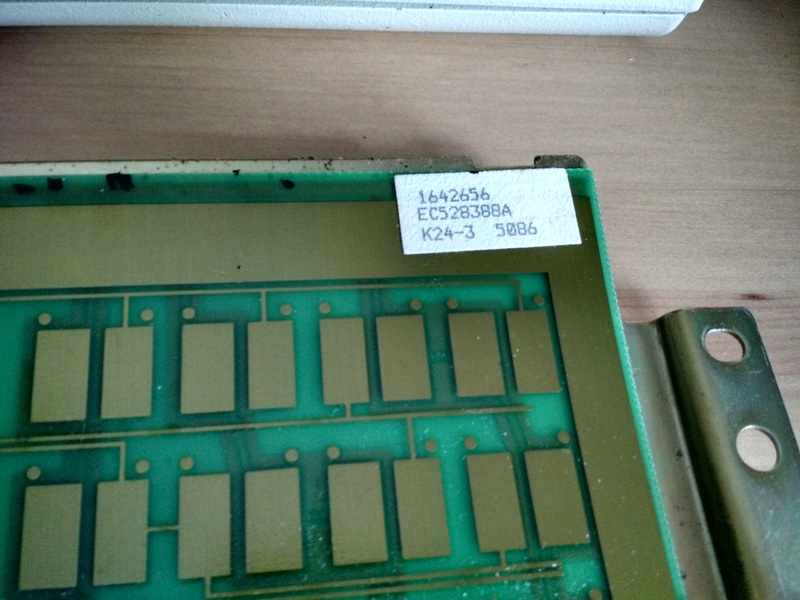 Super cool how they slide apart without any screws; the PCB and plate are separated by a thin plastic membrane that was very clean. 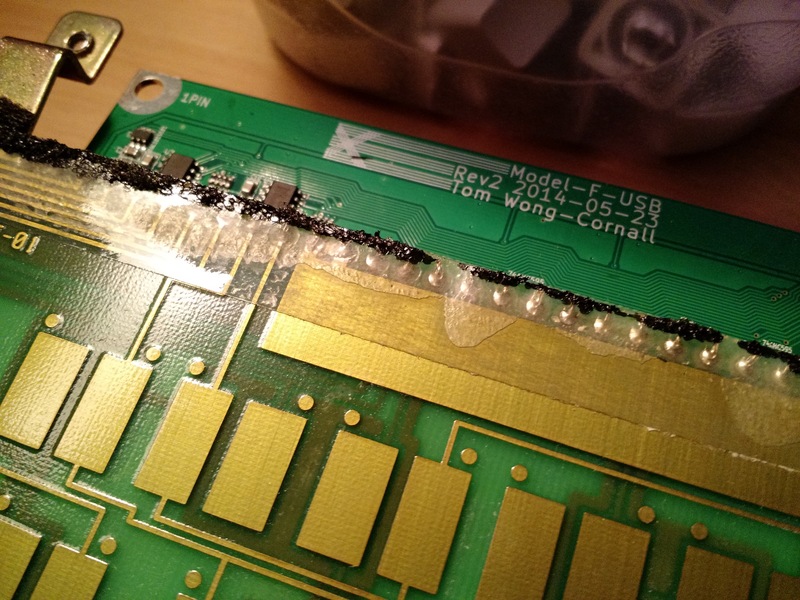 This picture makes the PCB look pretty rough, but it really didn’t seem as bad as it looks in this picture. 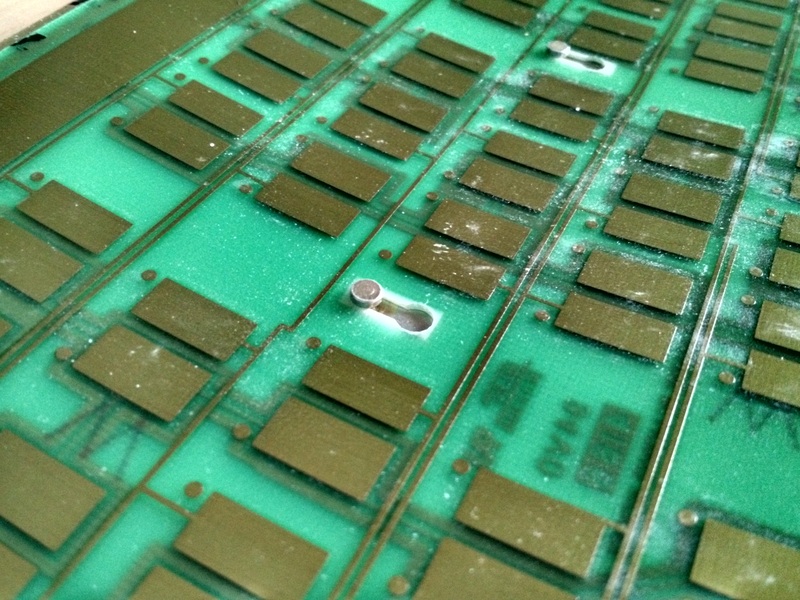 A light wipe with isopropyl alcohol on both the PCB and the membrane cleaned them up nicely. 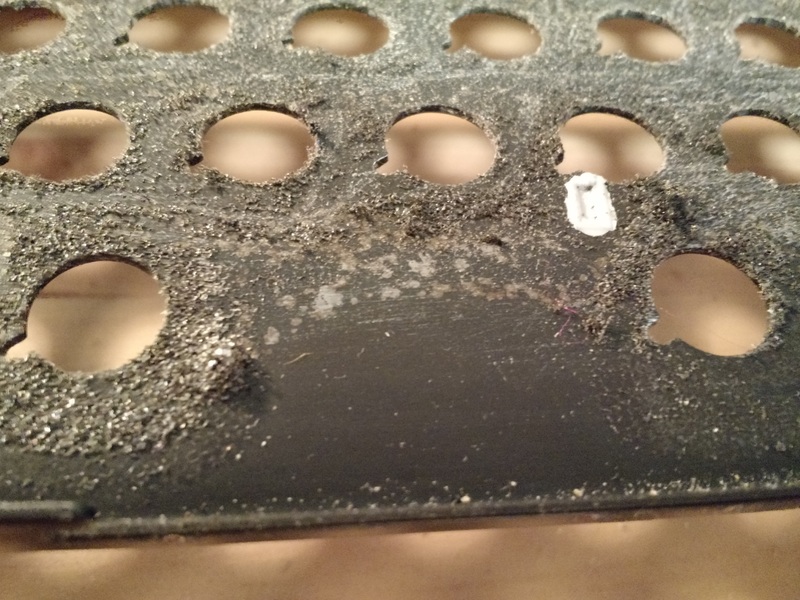 The foam residue was notable: it literally dissolves in alcohol and comes right off, even large chunks. 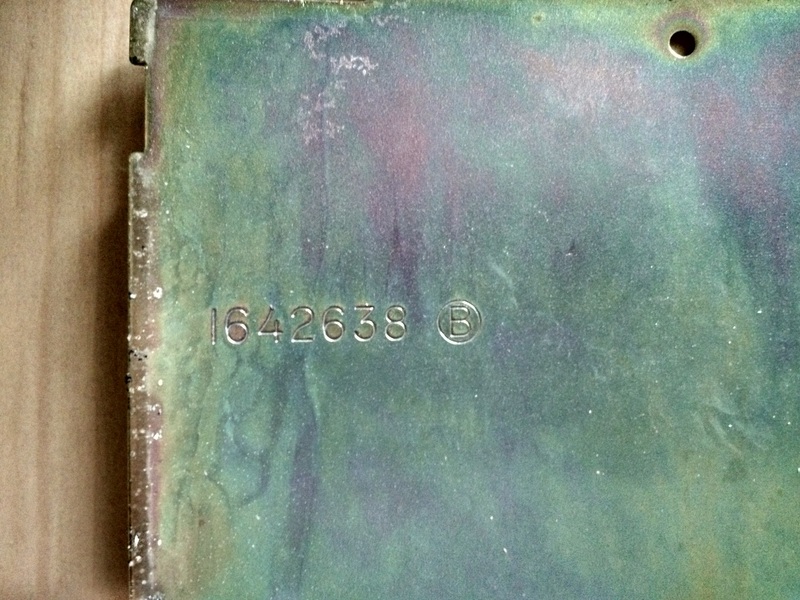 The back plate has a heavy amount of corrosion and the more serious rust spots. 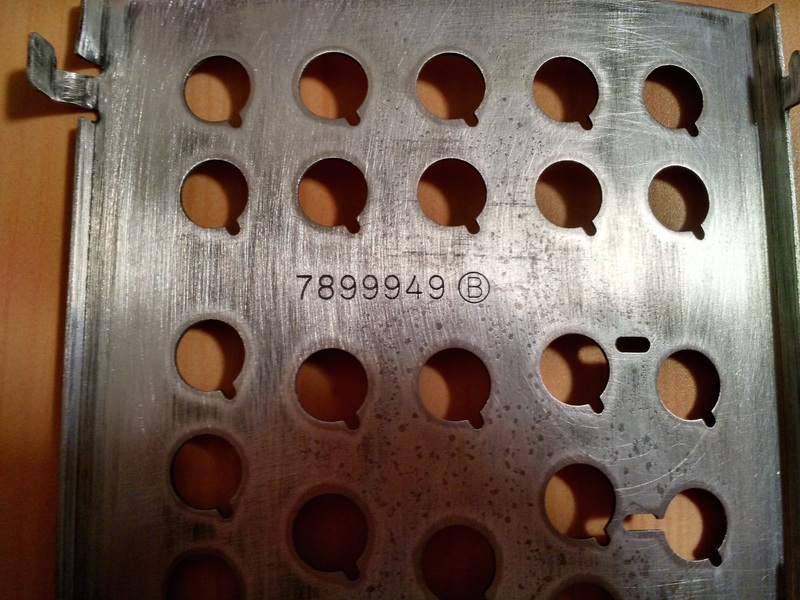 Looks like it was labelled twice, but looking at it closely under the light it looks like only the top label was filled out. Who knows. A razor and a hair dryer to soften the adhesive and the labels came right off. I’ll be laminating them and storing them inside the case. 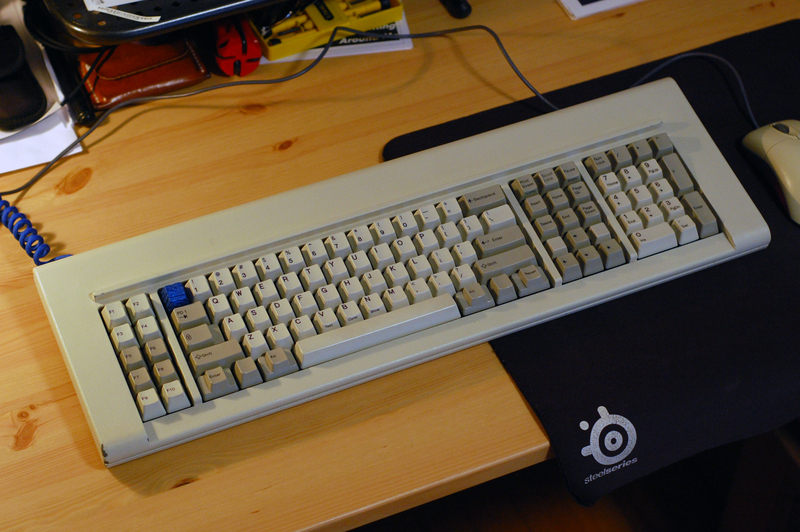 I decided to go with a clear Rust-Oleum left over from my Model M bolt mod to change things up on the backplate. 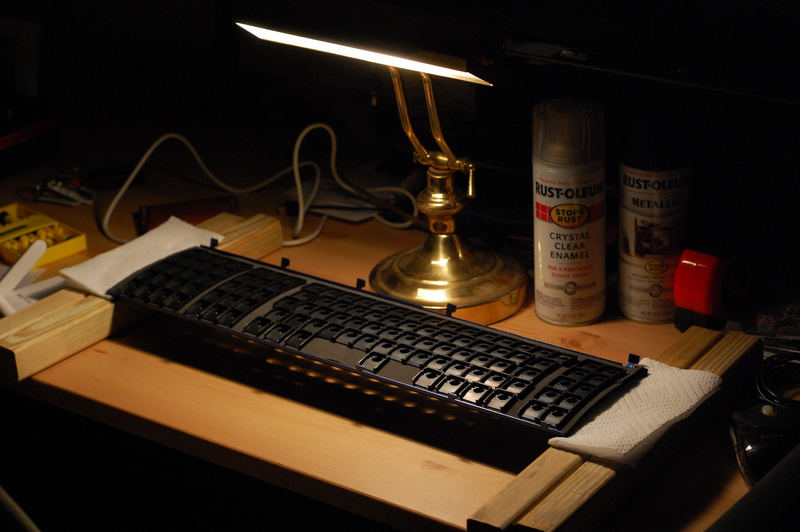 Did similar 3 coats (one light, two medium) with 600-grit wet sanding in between. 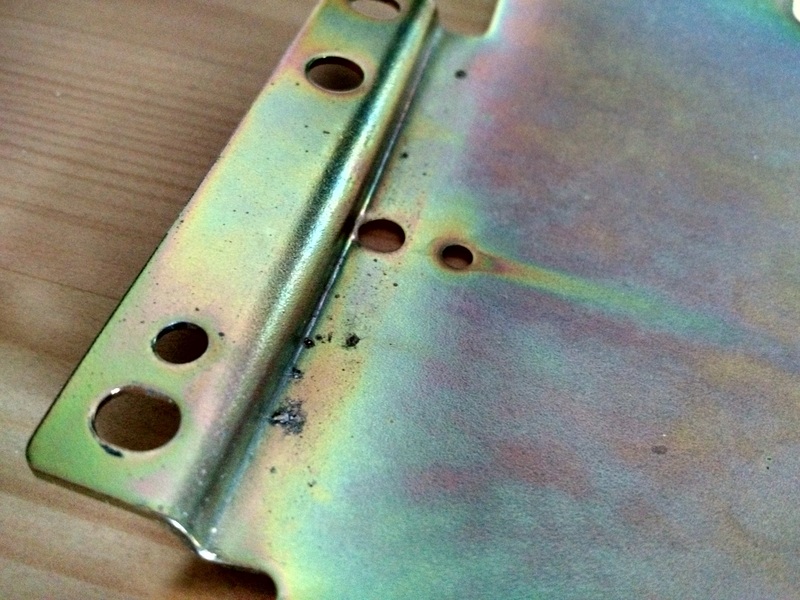 Couldn’t easily get those few offset bolt holes, but I kind of like how they retained their brassy finish. Once the back plate was dry (I waited 24-hours in between each coat on both the barrel and back plates) it was finally time for re-assembly. 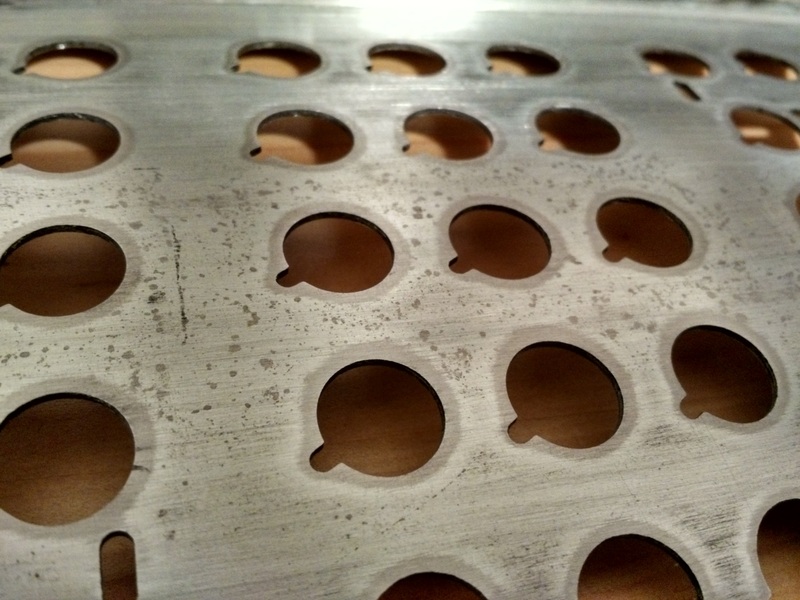 Looks like the foam holes line up fairly well. I had to shift it around a bit in a couple places but its final resting place had decent clearance for all of the barrels. The sun sets early this time of year, and this is how I left her for the night before putting the PCB assembly on top. I didn’t take any pictures of the clamping and sliding process; the documentation elsewhere is pretty good, you kind of just have to figure out a setup that will work for you. I used a long bar clamp and two spring clamps with paper towels to prevent ripping off some of the paint. 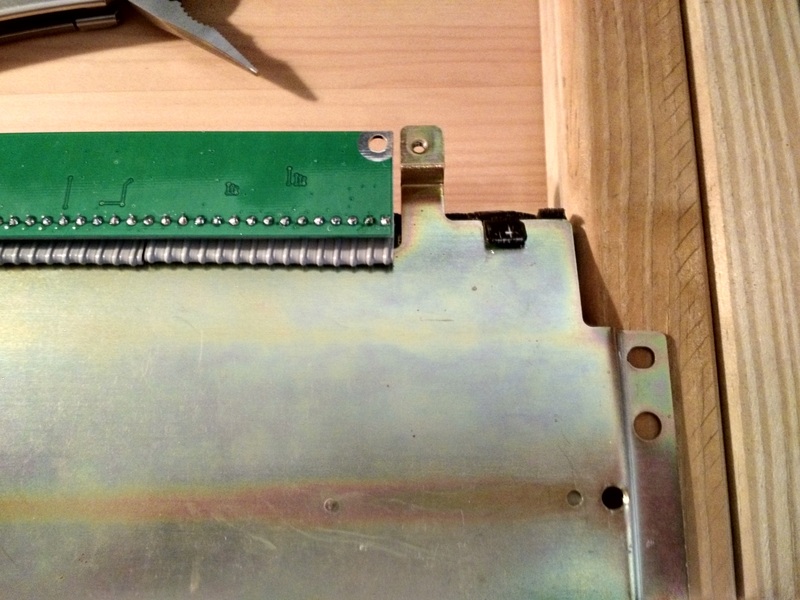 The only real problem I had is that there are few places where you can apply the spring clamps when the board is assembled with all of its barrels filled with springs. Around the spacebar is a good place and I had to try and squeeze on in sideways up by the Backspace key. 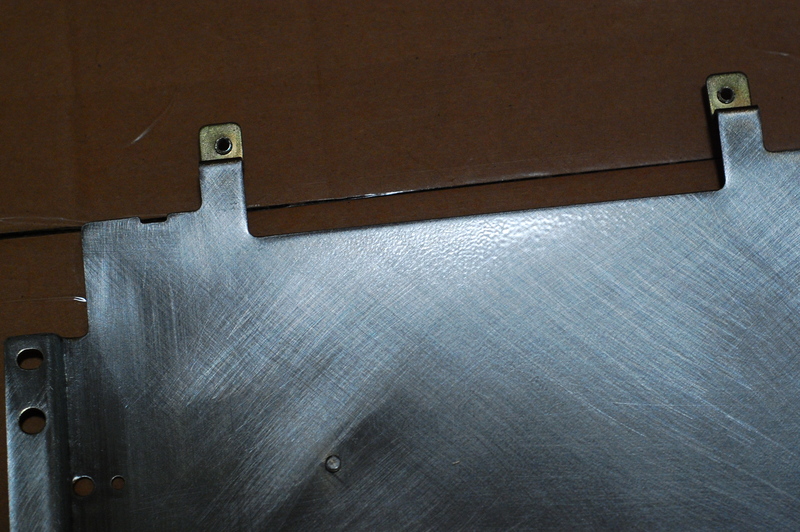 They gave me enough compression to slide the plates together and bend the retaining tab back into place. 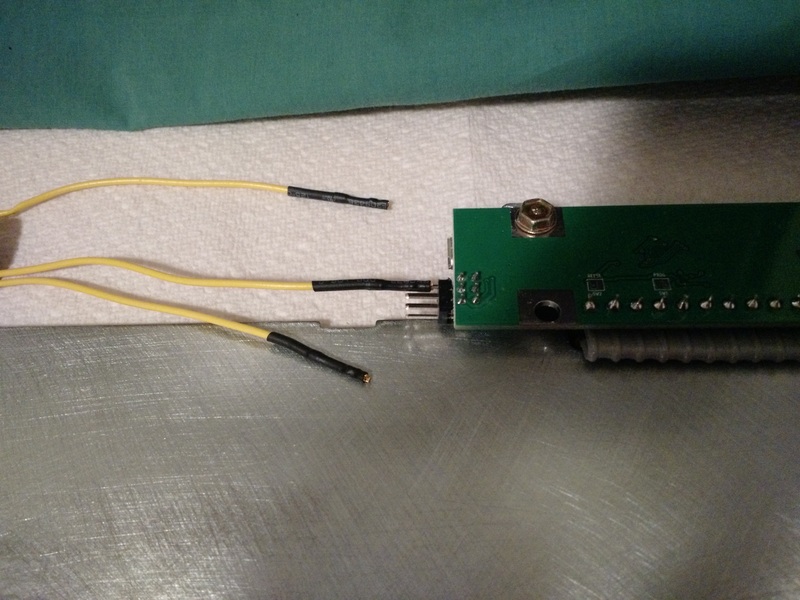 One problem I haven’t seen solved well is hooking up the piezoelectric buzzer to xwhatsit’s controller’s headers. 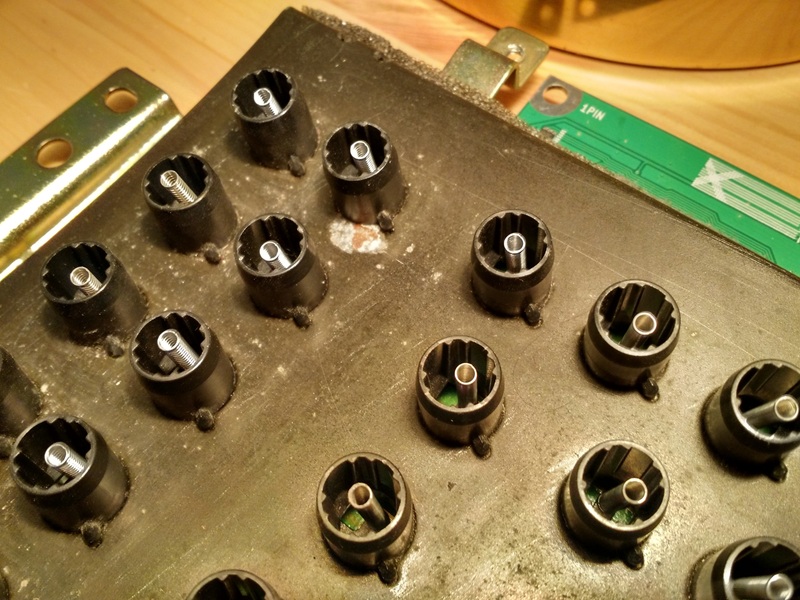 The issues is that there are tabs blocking the headers which I did not want to remove, and the buzzer’s connector was far too bulk to fit around it. 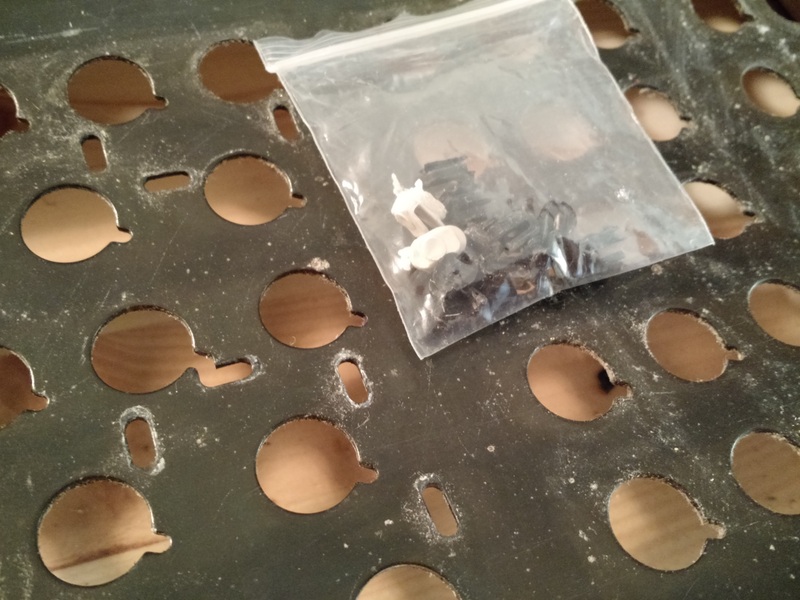 To solve this, I removed the individual pins from the connector and shrink-wrapped each one individually so they could slide by the tab. Seems to have worked pretty well! The buzzer is in surprisingly great condition. 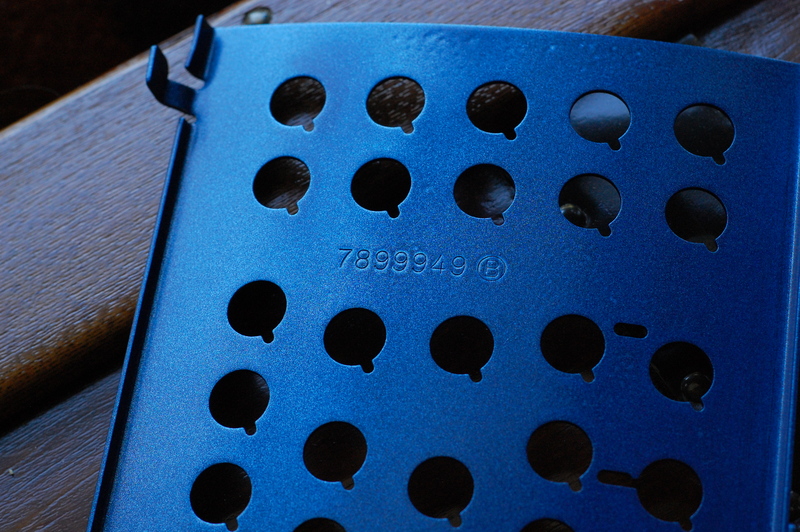 There was a significant clump of dust around the dial that is exposed on the underside of the case, but it seems to have shielded the rest of the buzzer from anything else. 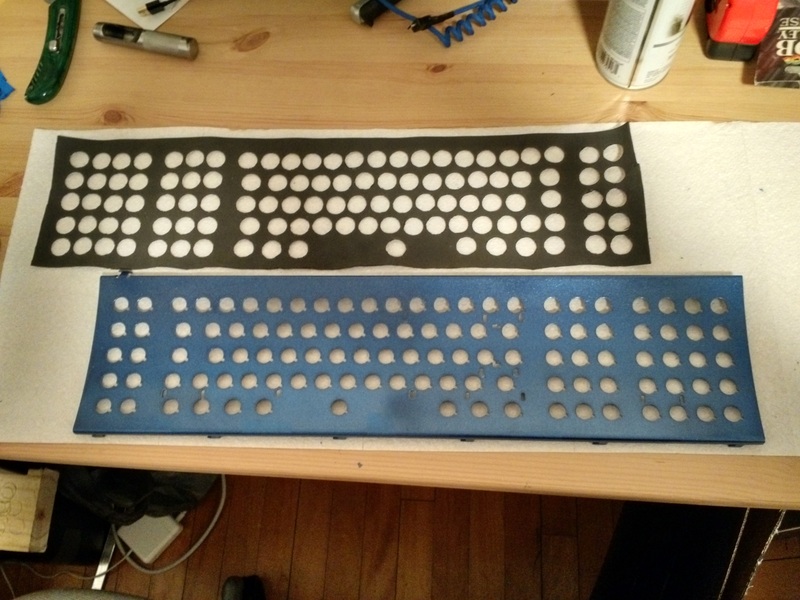 After assembly, my main concern was the feeling of the stabilizer keys, as I had replaced the wire stabs with the more modern plastic stabs on all but the spacebar. I tend to favor wire stabs (I favor Costars far over Cherrys) so I was nervous they would change, but to my pleasant surprise there wasn’t much of a noticeable difference. 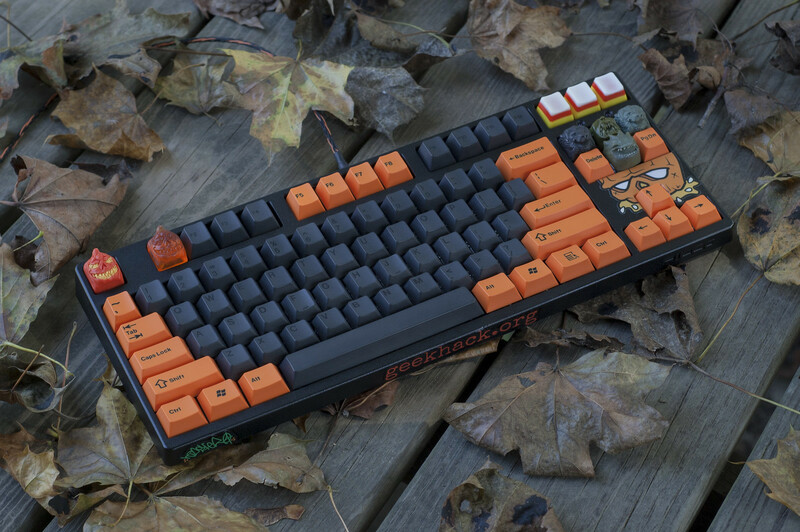 Testing keys; they all check out! They feel great as well. Some of the keys around Enter and out along the centerline through the numpad have a little more reverb in their springs than the rest of the board, but it’s not very noticeable unless you’re listening for it… and feeling for it; you can feel the spring reverberating under the Enter key, which to me is awesome! Overall, I couldn’t be happier with how this board turned out. It’s been a long process since I got it a year ago, but it’s one that I can’t ever see leaving my collection, unless until one of my grandchildren want it some day haha; I wouldn’t be surprised at all if this one outlived me. They really are built like a tank, and it feels fantastic to type on. 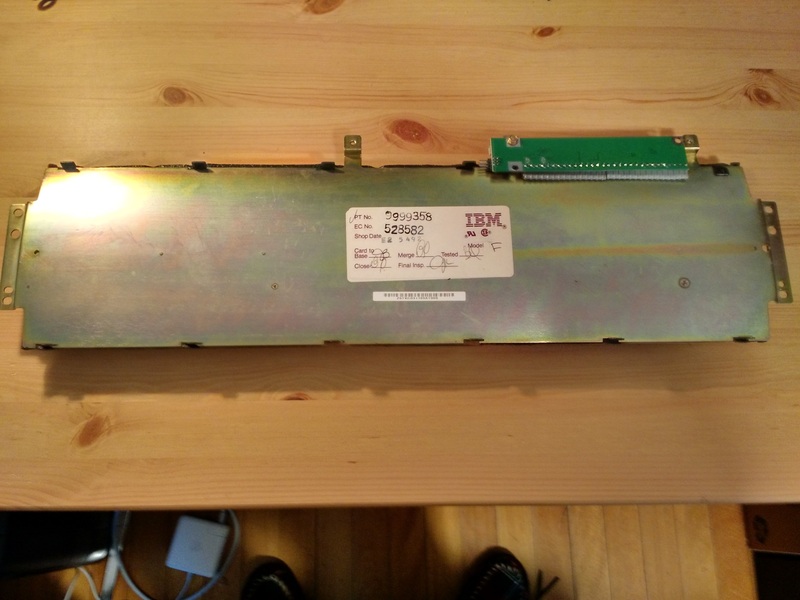 I can’t imagine anything short of a fine beamspring feeling better than a 4704 Model F. Sure it’s big, but I think that’s part of its character: heavy board, heavy ping. 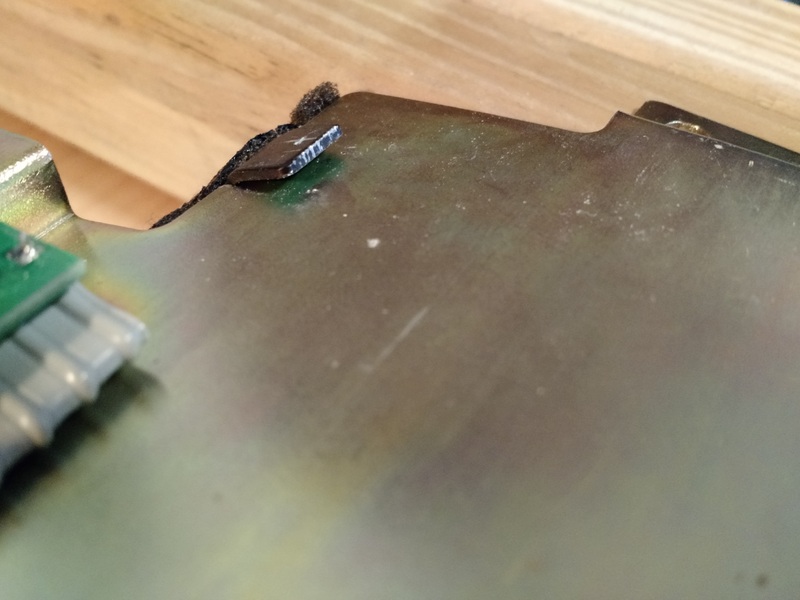 Damn all it took was some sandpaper to take off the corrosion? I gotta do that on my 4704 plate too. 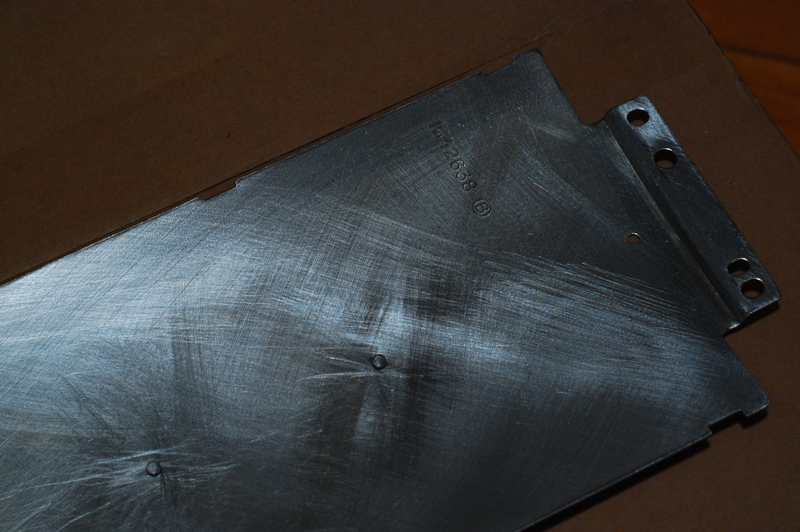 My backplate is in good shape iirc, but my barrel plate is in so so condition. Thanks for documenting your process. 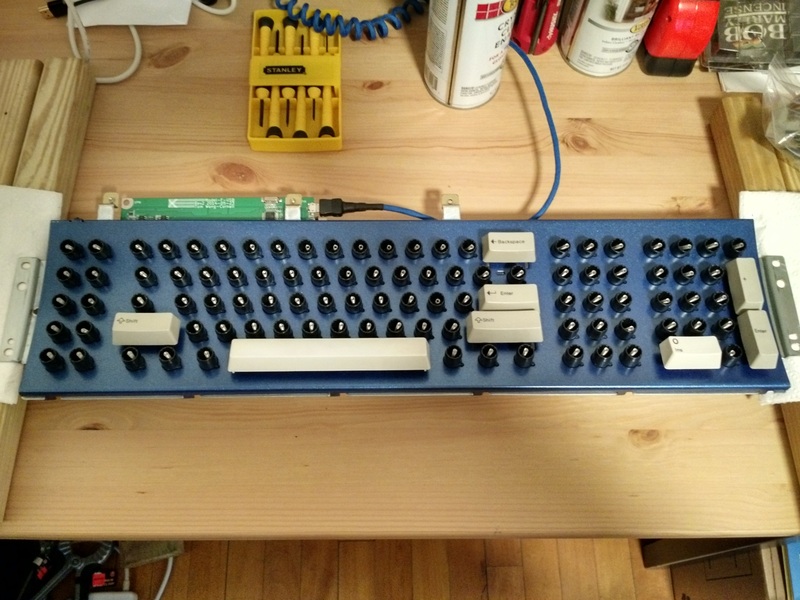 Great build log too . 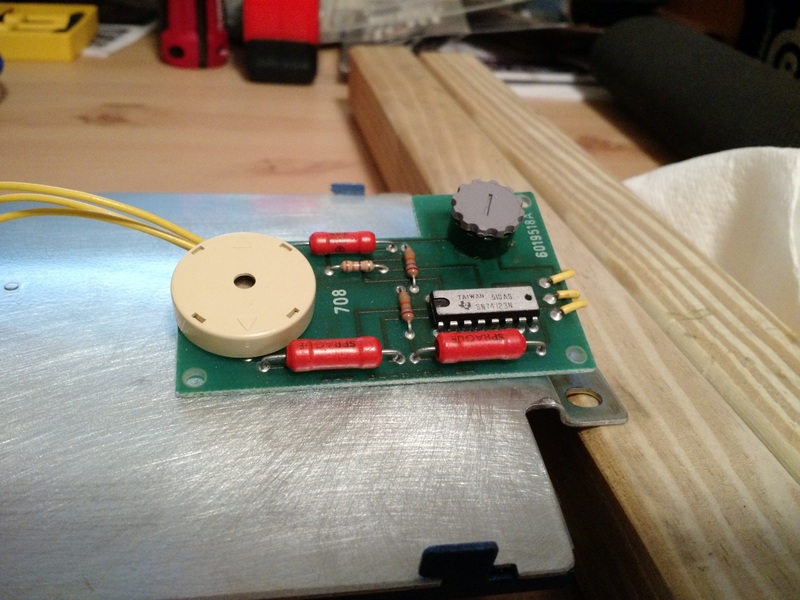 Edit: Huh, I just realized what you did to get the buzzer working with the xwhatsit controller. I gotta try that too . Very nicely done! Looks awesome! 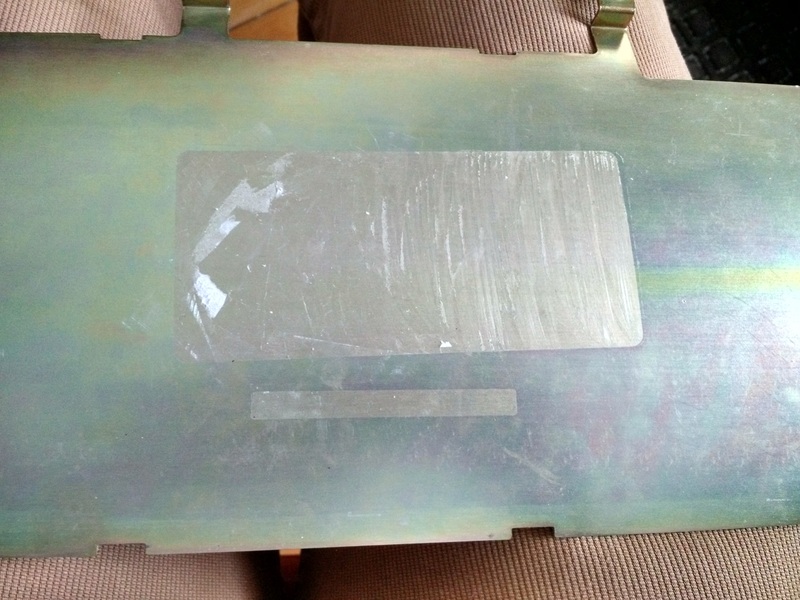 Yup, sandpaper seems to have done it for the most part, aside from those small spots that were still visible. 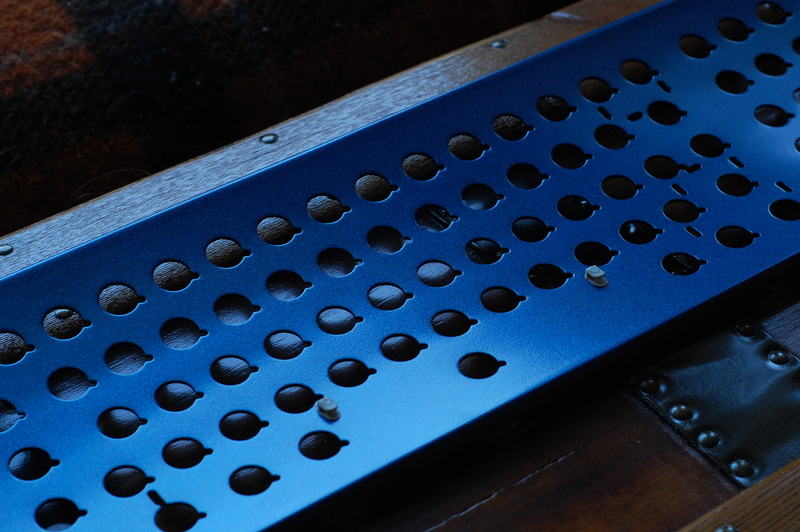 The barrel plate is much easier to hand sand than the backplate, fewer odd pieces sticking out every which way. Gel paint stripper did a good job taking the original paint off of the outer case, except for the tightest little nooks and corners. I spent a lot of time trying to get it out, if I had realized that I was going to prime and paint it, I would not have bothered. Do not laminate the labels! 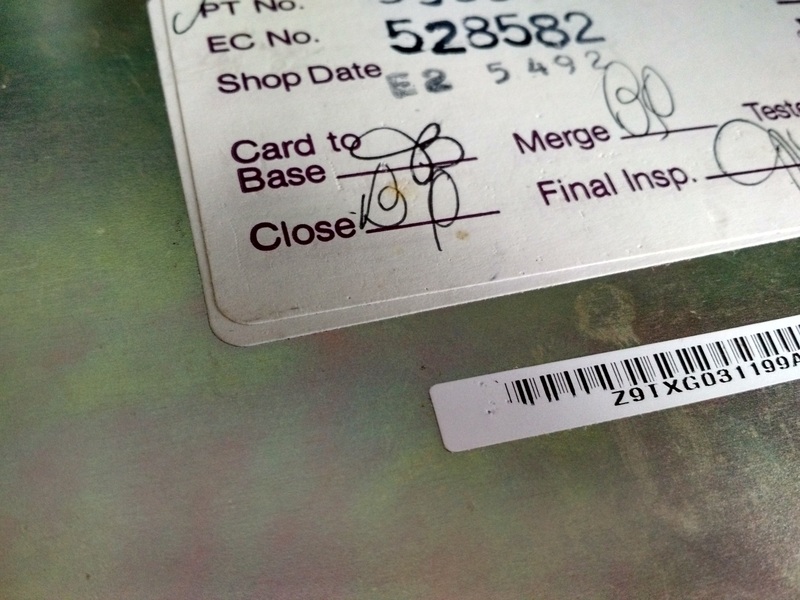 Plastic used sold laminating is not chemically stable and will start to rot the paper it contains after 15-20 years. 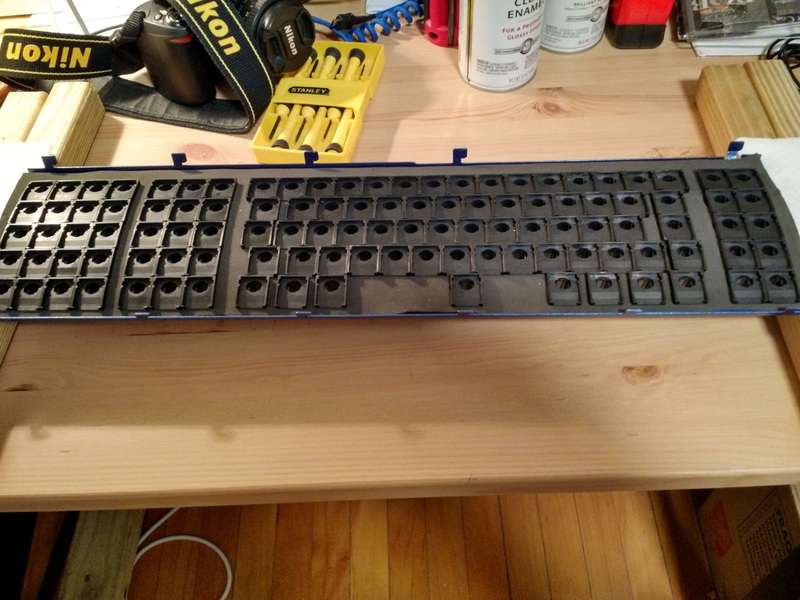 Your keyboard will easily last longer than than. 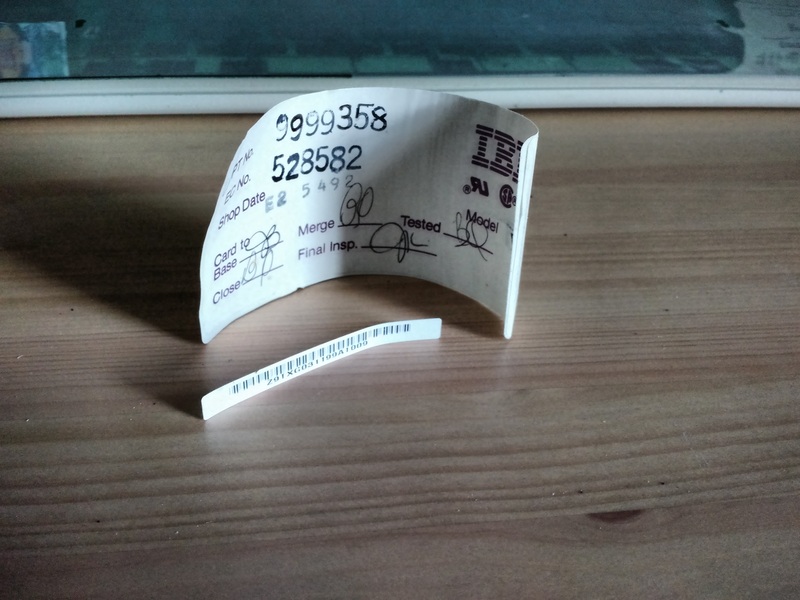 Better to simply enclose the labels in a slip made of acid-free paper. Any high-quality photocopy paper should do. 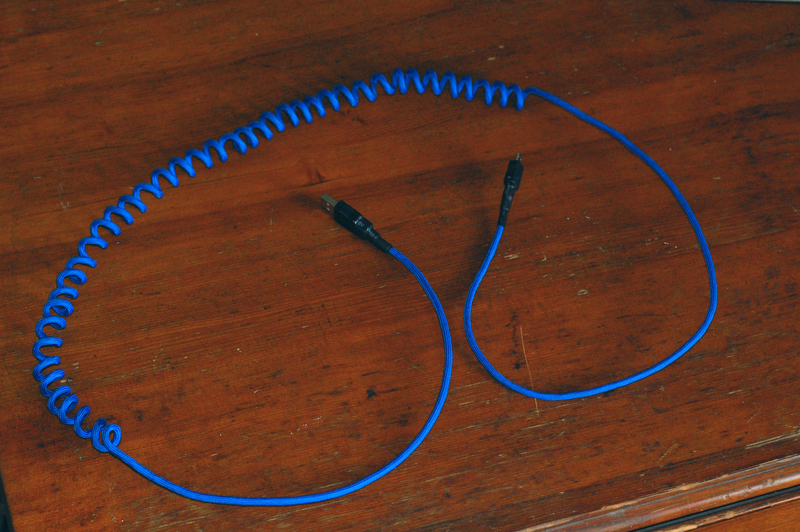 Blazed Blue is such an awesome shade of blue, great job matching the cable and plate. Yeah it's a beaut for sure, I'm very fortunate, they seem to be getting harder and harder to find. Thanks for the tip! 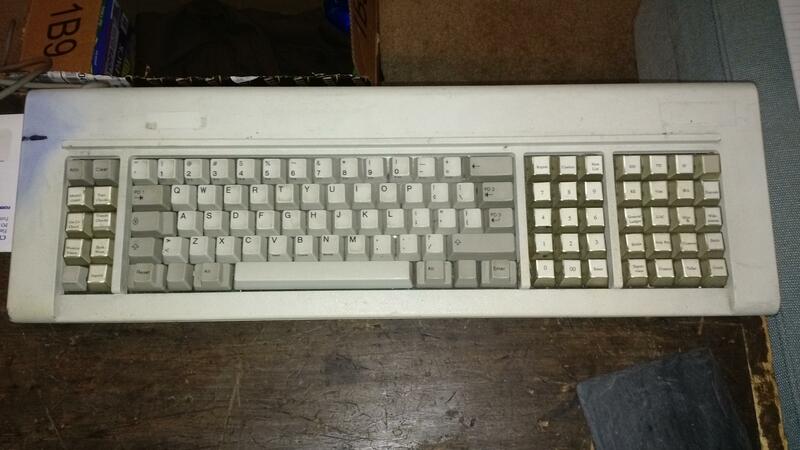 The labels are actually still sitting in my drawer, I couldn't find the laminating sheets I used for my Model M label.